"Alcanada is on the Northern tip of Majorca close to the town of Alcudia. It is perhaps a less well-known course to the more famous Santa Ponsa in the south. It is however every bit as good, if not better. Firstly the scenery is spectacular running from the coast up in to the rolling hills. The view across the bay to Alcudia with the island and its lighthouse is a unique feature. The layout of the course is varied crossing valleys and ravines, plenty of very elevated tee shots and a stiff coastal breeze on the flatter section close to the coast. This Robert Trent Jones Jnr design is, as you would expect, perfectly manicured with the greens fast and true. The fairways are lush and you are guaranteed a good lie everywhere. I cannot recall a hole that I did not enjoy – the elevated tees were a real buzz, with a couple of reachable par fives. The par fours are varied from short and tight holes to 450 yards plus. There are also four good par threes, a couple over 200 yards. I have played several courses on the island and this is easily the most enjoyable but is also the sternest of tests. It was however on the pricey side (approx.100 Euro), but was also very quiet and proved to be an effortless round of golf – if you have not got a handicap certificate, forget it you will not be allowed to play. This course is worth playing for the setting and scenery alone but that said, I can not see how someone could come away from here feeling disappointed with the challenge of the course either – I will certainly be playing it again when I am next on the island. A hidden gem given that the north of the island is not renowned for its golf courses. Alcanada has put it on the map!" The club closed from December 2018 to February 2019 to allow a €600,000 renovation to take place, involving the reconstruction of putting surfaces, the replacement of bunker sand, an upgrade of the irrigation system and the repair of cart paths. Wauw ...... what a place, 17 holes with seaside view and sea view, total peace and calm conditions, and a very exciting design and layout. Every hole a challenge, but so fair and welcoming in all aspects. Sure, you have to be on top of your game and you have to produce solid shots, especially from tee......... but we (4 Danish golfers, played here 12 times over 5 years) always enjoy the quality of greens, fairways and teeboxes..... and even the bunkers are so well kept, its actually fun to hit from. The clubhouse proshop is awesome, be careful, you want to buy the whole place...... and the terrace view and setting after an eventful round, is the perfect way to get your pulse down to normal again. Cannot imagine ever again, being in Mallorca, without playing Alcanada ........ Its almost criminal behavior, if you consider yourself a true golfer......... We love it here !!!!!!!!! Alcanada is a test of golf that nature intended. There is no artifice here and although it is extremely tough and certainly no place for the novice I rate it the best course on the island because it is so natural. There are no artificial lakes or fountains here, just a quiet peace and the breeze blowing in off the Bay of Alcudia. On a quiet, sunlit day when I played it on a late September weekday it could not be faulted as there is such a natural flow to the holes that leads you up around the slopes and down to the coastal plain of this wonderful course..
My playing partner and I flew round, although we did take a buggy as this is a testing walk for the older golfer, in a shade over three hours. The fairways were green and lush with the ball sitting up nicely and the greens, many of them with some fiendish slopes, were consistently true. To score well around here accuracy is more important than distance although a number of raised tees give the big hitters a chance to open their shoulders. I could not name a weak hole on the course although with the drama and spectacular views that are on offer on the front nine, with a ravine to cross on the very first hole and some long holes to follow, the last hole is something of an anti-climax. But that is only a minor quibble. The facilities are every bit as excellent as the course with sensational views out to sea on the terrace and some excellent food and wines to savour. As I sat enjoying a glass of excellent Rioja and gazing out to the lighthouse the club has taken as its emblem my one thought was when can I come back here again to play. 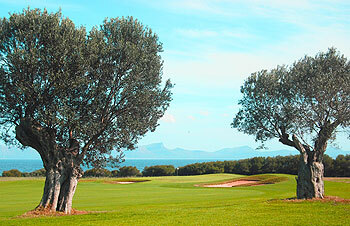 If you are a serious golfer and on Mallorca you must play Alcanada. My third round here and I like this course a lot and there is a really good club atmosphere with a decent combination of friendly members and visitors from several European countries. It is still relatively a young course, opened in 2003 but the feel is one of a mature course of more than thirteen years. The opening hole is very strong, a par-5 with a blind lay-up, so you need to trust your yardage and use the stroke saver well, the approach is then over a stream to the green around 120 yards away. The 2nd and 3rd holes are both very good but maybe a little similar as back to back holes; both are par-4’s with a slight dog-leg to the left. The 5th is a strong driving hole; just under 400 yards in length and coming from a great tree surrounded teeing area and is my favourite hole on the front nine. The toughest hole against par must be the 8th; 450 yards slightly uphill and although very straight is the strongest par-4. The first four holes of the back nine (pars of 4,5,4,5) are decent holes but do run adjacent to each other and there can be a little bit of a claustrophobic feel here. The 15th hole is the short par-4 that all courses should have and with an accurate tee shot, this is there for the taking. My choice of best hole on the home nine is the 16th, another big par-4 at close to 480 yards and seven fairway bunkers protecting. The 18th is a fun hole to play; around 350 yards with six great bunkers covering the last 130 yards to the green on the left. I would recommend the course to everyone and a special note about the greens; these are great to putt on and will not disappoint. Post round must be taken on the huge terrace looking out to the lighthouse on Alcanada island, very nice indeed. Great course over some brilliant natural golfing terrain and a terrific opening hole that sets you up well for what is to come. Some lovely holes, framed by the hillside on one edge of the course, and the sea on the other. Thoroughly recommend it if you are in the area. I am no fan of RTJ and if you have played a few of the courses he has designed, you will recognise his style straight away. However, could not help to be seduced by the sheer beauty of the site and the intelligent use of the natural terrain; whatever cosmetics were have been applied are subtle, at least to my eye. The first green, however, is crazy. We played with two older members who play the course a lot. They warned us about the risk of going off the green putting aggressively coming down the hole, then proceeded to do exactly that. We both gingerly took three putts to get into the hole. Do not mind that kind of difficulty, but perhaps not on the first hole, so it will be five balls rather than six for me. Already looking forward to the next visit! For enjoyment best course of Mallorca for sure! As we played the course the 10th of june. Already playing Son Termens, Bendinat and Son Gual this was our last stop. What a beauty of a course! Views spectacular, greens unreadeble, fairways perfect. From start to end challenging. Restaurant and practise facilities perfect. Tops Son Gual for me. Must play course. Unfortunately,we did not play Son Gual this trip to say which is the better but Alcanada is first rate in every way - facilities, staff, course, design & conditioning. Highly recommended for challenge, beauty, strategy, variety and despite a recent spate of rain & more rain, was in superb condition. Fantastic course and stunning scenery. I wish i'd played more golf prior to my visit to have done myself justice on this excellent layout, but thanks to the British weather it was only my third 18 of the year and as a result I found it tough going. The condition of the course was magnificent, the greens were true but very tricky with breaks and hollows aplenty.